Coll. No. 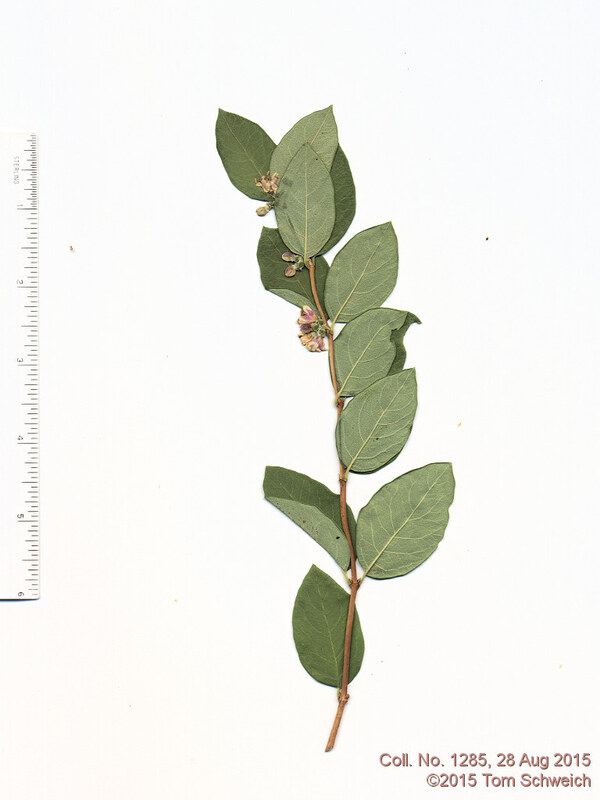 1285, 28 Aug 2015, characters observed: Woody perennial, to 1 m.; Leaves, cauline, opposite, 45 mm. × 28 mm. wide, ovate, margin, entire, revolute, becoming toothed with age; Flowers, ±8 in dense axillary clusters; Corolla, tube 3 mm. + lobes 3 mm. = 6 mm., hairy at level of insertion of filaments; Stamens, exserted; Style, exserted; Fruit, 5 mm. Field Notes: Coll. No. 1285, 28 Aug 2015. Other photos about Species or Caprifoliaceae Symphoricarpos occidentalis.